A friendly twist on an old favorite. Defrost turkey according to package instructions. 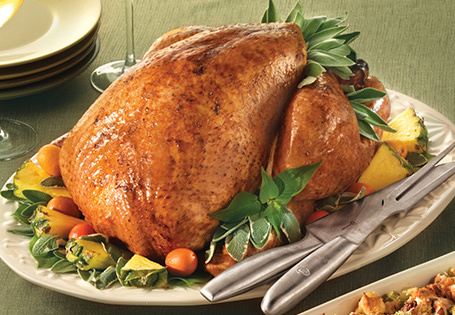 Remove all innards from the turkey cavity and rinse with cold water inside and out. Pat dry both inside and out. In a large pot, boil apple cider, salt, orange rinds and juice. Set aside to cool. Pour into a clean 5-gallon bucket. When cool, add ice, one gallon of cold water and then turkey, making sure to fill cavity with liquid. Refrigerate overnight. Drain turkey and pat dry inside and out. Discard remaining brine. Arrange turkey, breast side up, on a roasting rack in a roasting pan. Loosely stuff turkey cavity with Island Stuffing. Pour 2 cups of water in bottom of pan. Melt butter in a saucepan with pineapple juice and cook 2 minutes. Set aside. Add salt and pepper. Truss legs together with butcher's twine, then brush the turkey with the melted butter mixture. Bake for 2 1/2 to 3 hours or until internal temperature reaches 165°, occasionally basting the turkey with pan drippings. Cover with foil when the bird starts to brown.